Turkish cuisine is famous around the world for its ‘sucuk’ (soo-JOOK’), the name of a variety of spicy beef sausages found in Turkey, the Balkans, the Middle East and into central Asia. Like its name in Turkish, this sometimes spicy sausage is called similar names in neighboring countries. ‘Sudzhuk’ in Bulgaria and Russia, ‘suxhuk’ in Albania and ‘soutzouki’ in Greece to name a few. Turkish ‘sucuk’ is usually made with ground beef. Further East in Kazakhstan and Kyrgyzstan, it's said ‘sucuk’ also contains horse meat. ‘Sucuk’ is known for being spicy. It’s flavored with salt, black and red pepper, garlic, cumin, sumac, and other common Turkish spices. You can find ‘sucuk’ with nearly no spice at all to very fiery varieties that will bring tears to your eyes. The traditional way to prepare ‘sucuk’ is to grind the meat several times then knead it for a long time with the spices. It’s then fed it into natural or plastic sausage casings and left to dry for several weeks. 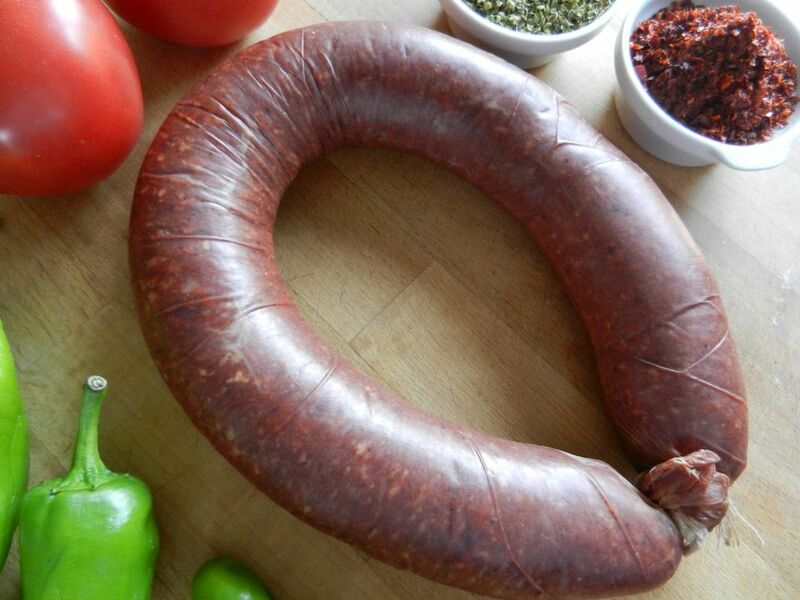 The salt and spices preserve the meat during the drying and fermentation process, leaving a hard, dry and flavorful sausage with a high-fat content that’s ideal for frying and grilling. Despite stricter laws and heavier fines, many neighborhood butchers still make their own ‘sucuk’ from meat scraps and fat left over from carving. The quality of locally made ‘sucuk’ varies from very good to very poor. One of the best places to enjoy ‘sucuk’ is along with a traditional Turkish breakfast. Slices of ‘sucuk’ are usually pan fried with no added butter or oil and served along with Turkish cheeses, fresh white bread, black olives, honey, fruit preserves, and brewed black tea. ‘Sucuklu yumurta’ (soo-JOOK’-loo yoo-MUR’-tah), or ‘sucuk’ and eggs’ is another way to serve this spicy sausage at breakfast. Slices of ‘sucuk’ are fried in a small, single-portion copper skillet called a ‘sahan’ (sah-HAHN’). Once the ‘sucuk’ is crispy and has released enough fat, the eggs are broken on top. The egg yolks are often left runny to allow for dipping crusts of bread in the mixture. The second place ‘sucuk’ really shines is when cooked on the grill. Slice it, skewer it, grind it up, and make meatballs out of it. However you decide to cook it on the grill, the result is out of this world. Grilling ‘sucuk’ allows the fat to drip away leaving you with flavorful and fairly low-fat grilled sausages. Grilled ‘sucuk’ is often sandwiched between chunks of white bread or wrapped in flour tortilla-like ‘lavash’ bread. Grillers often gather around the fire with chunks of bread in hand to take pieces of sizzling ‘sucuk’ right off the grill. For this reason, many Turkish ‘mangal’ (mahn-GAHL’), or barbecue parties often take place on foot! ‘Sucuk’ is also used in Turkey’s unofficial national dish, a navy bean and tomato stew called ‘kuru fasulye’ (koo-ROO’ fah-SOOL-yay). You'll also find it as a filling for pastries and thinly sliced inside grilled cheese sandwiches, better known as ‘tost’. If you don’t live in Turkey, you may be able to find ‘sucuk’ at Middle Eastern and Greek grocers. You can also find it on websites selling Turkish foods and ingredients.